This is becoming such a popular hack we figure someone needs to come up with a name for it like Google-travelling or Google-cising (exercising with Google). 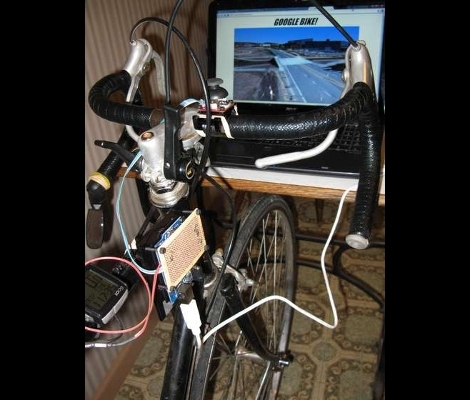 It’s a bike controller for Google Earth. [Braingram] broke out his road bike, setting it up in the trainer in front of his laptop. If you already have a computer with a cadence sensor this will be a snap. These measure the crank rotation using a magnet and reed switch. So as not screw up his summer biking [Braingram] spliced into the sensor while leaving it attached to the bike computer. From there it is read by an Arduino which also monitors an analog joystick attached to the handlebars. A little bit of Python scripting and you’ll be ready to go. Be sure to check out some of the other variants like using an exercise bike, or adding a wearable display. [Markus] got his hands on a split-flap display and built a controller for it. These sometimes can be found on really old alarm clocks, but [Markus] was a lucky-duck and managed to acquire this large 8-digit display which previously made its home in a railroad station. They work like a Rolodex, mounting flaps around a cylinder for a full alpha-numeric font set. A PIC 12F683 was selected to control the display, using optoisolation to separate the 42V display motors from the driver circuit. From the video after the break we think he did a wonderful job of getting this working. It only takes six I/O pins to control and the sound and look of the digits scrolling leaves us quite jealous. So what’s he got in store for it? The first thing he did was use it to count down to the New Year. Most augmented reality takes images of the real world and superimposes virtual data on top of them. [Michael Winston Dales] went a different direction, using the virtual world of Minecraft to control objects in the physical world. In the video after the break you can see him use switches that he built inside the game to turn the LEDs pictured above on and off. You’ll also notice that in-game sign instructing a player to stand in one spot to Tweet. Since Minecraft is written in Java there are some mods that allow you to hook onto in-game events. [Michael] does just that, triggering his own scripts to send data to an Arduino, or use a Twitter API. 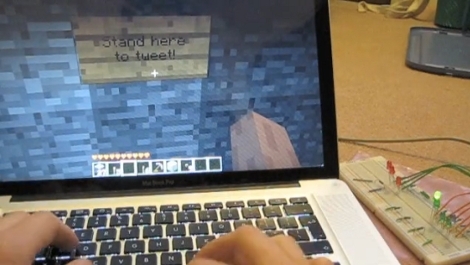 Now this something that should be used with the Minecraft ALU. It takes the sandbox method of gaming to a new place, doesn’t it? [Kevin Sandom] built this boat using a radio controlled toy car. 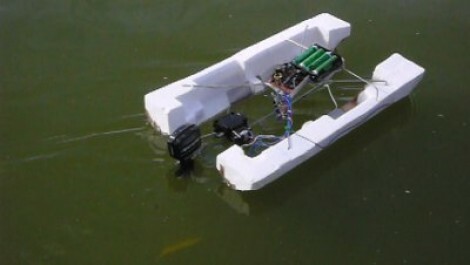 The two pontoons are recycled from Styrofoam packaging material using some thick wire to connect them and provide a framework for the propulsion and control circuitry. The motor itself is a hobby outboard, which really only required [Kevin] to develop a method for steering. He walks us through the build process in the video after the break, where we find out that the original toy has a pretty bad design flaw. It seems the car used four AA batteries to drive the motor, but one of the four batteries was also used separately from the other three to power the control circuitry. Running that battery down faster than the others shortens the life of the whole. This is considerably easier than the underwater ROV hacks we’ve seen before. We do think that it would make for a fun weekend project, and we’d bet you’ll get some weird looks for piloting what appears to be garbage around a pond. [Johannes Agricola] recently held a workshop at the Peace Mission in Goettingen, Germany where he shared his RGB LED flowers. The small round PCB hosts an ATmega88 microcontroller which is running the V-USB stack so that the unit can be controlled by a computer. 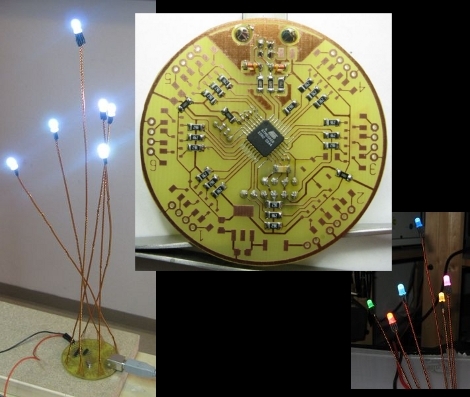 Each flower blossom is an RGB LED connected with four enameled wires which, when twisted together, make up the stem of the flower. [Johannes] took tons of pictures during the assembly while offering soldering advice along side the illustrations. The PCB is single-sided helping make this a great project for someone trying out surface mount component soldering for the first time. Or if you want something a little more free-formed try out this lemon-juice powered LED flower.